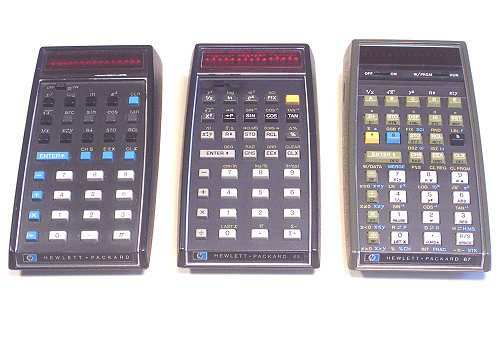 This page gives a brief description of some of the early Hewlett-Packard electronic calculators that have come my way from sources within Australia. 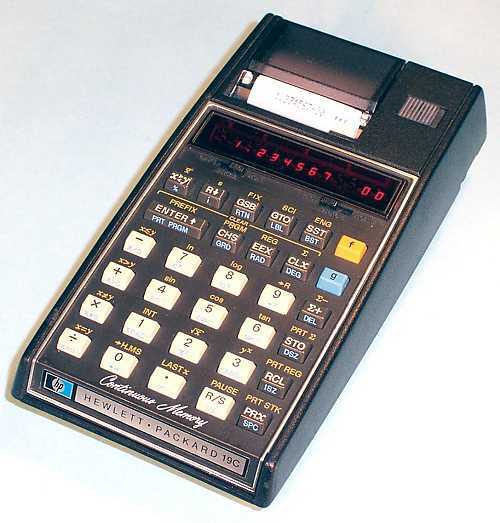 Detailed technical and historical information on the full range of Hewlett-Packard machines is available on-line at The Museum of HP Calculators. The Model 9100 was Hewlett-Packard's first calculator, introduced in mid-1968. It combined a full range of scientific functions with an extensive programming capability, including a magnetic card system for storage of programs and data. The machine was built entirely with discrete transistors, diode-resistor logic, and magnetic core memory - there are no integrated circuits. This remarkable calculator was at least five years ahead of its time, and served as the benchmark against which all others were judged. Its price of just under US$5000 was four times the price of a top-line mechanical calculator, twice the price of most electronic machines, and more than a year's wages for many people at that time. The illustration shows the "B" version, with increased memory capacity. This machine originally belonged to the State Electricity Commission of Victoria, where it was used for power system calculations in the engineering departments. 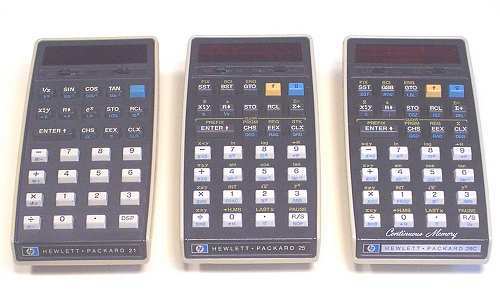 HP's second-generation desktop calculators included three quite different models. The 9810 was basically an "upgrade" of the 9100, the 9820 used an algebraic keyboard language, and the 9830 was programmable in BASIC. Internally, however, the three machines were very similar. All were based on a 16-bit serial "mini-computer", built with MOS-LSI technology and semiconductor memory. The personalities of the different models were determined by the internal micro-programming, and by changes to the keyboard and display. The 9810 had a 3-register display similar to the 9100, but using LED displays instead of the CRT, and it had an (optional) internal printer. The basic machine did not include the full complement of scientific functions, but relied on (optional) plug-in ROM modules to provide a choice of mathematical, statistical, or other functions. An auxilliary keypad with interchangeable overlays provided the user interface to the additional routines in the ROM modules. 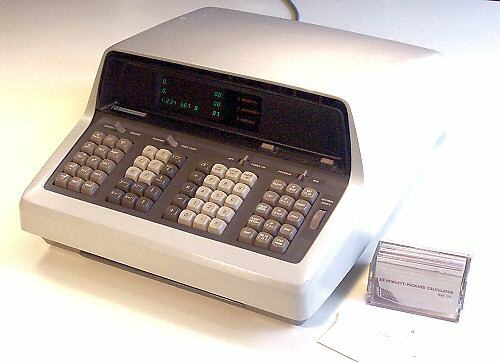 This particular machine served for many years as the "office calculator" for a firm of surveyors in Melbourne, Australia. It came to me with the printer and mathematical ROMs, the original manuals and dust cover, and a documented library of survey calculations on magnetic cards, prepared by the original owners. 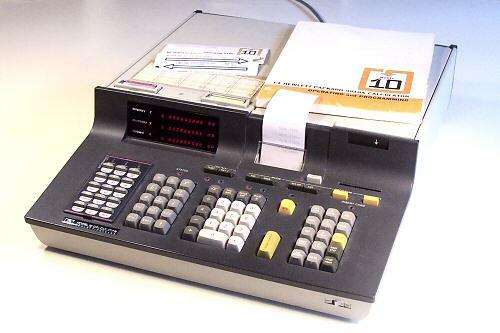 Model 29C, 1975, programmable, "continuous memory"
The HP Model 19C is a programmable scientific calculator with an in-built miniature thermal printer. The calculator is functionally equivalent to the second-generation Model 29C (above), but has been re-packaged into an older-style case to accommodate the printer and a 4-cell battery pack. The printer will record the numerical display, the registers and stack, or the full program listing on its tiny (1-1/2" wide) paper roll. Original text and images Copyright (C) John Wolff 2003.